In the 1960s, Ipswich went mad. Town planners devised a scheme whereby the population would rise towards half a million, and the existing town centre would be encircled and crossed by urban motorways. They didn't get very far with their plans before the men in white coats came and took them away, releasing them into the wild somewhere like Croydon or Wolverhampton, but the towering Civic Centre, the brutalist police station and the Civic Drive road system were left as evidence of their ambitions. The Civic Centre and the police station have since been demolished, but the four lane Civic Drive still cuts across what was the Mount residential area, the little terraces all demolished to make way for the 20th century. Today, the Ipswich plan designates this whole area for residential use, and the civil servants have all moved down to the river. This new plan, if it emerges, can only serve St Matthew well, sitting beside Civic Drive as it does, and cut off from the town centre by it. 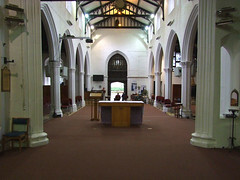 The church is, perhaps, less well-known than the other working town centre churches. Partly, this is because it is the only one of them which is kept locked, but also because it is such an effort to get to if you are a visitor. Because of this, many people don't realise that it contains a treasure of national importance. 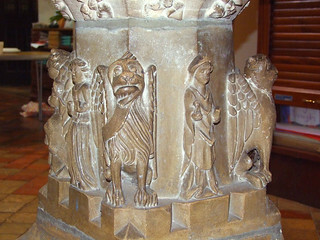 It is the early 16th Century font, which is quite unlike any other in Suffolk, and is perhaps unique in England. Before we come to it, the church building itself is worth a look. This must once have been quite a small church, but is now a big one. Its core is 15th century, including the lower part of the tower. Nothing else is. 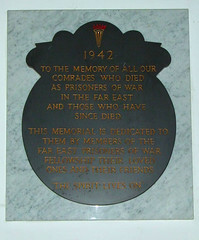 Its 19th century expansion can be explained by the proximity of the Ipswich Barracks, for this became the Garrison church. This resulted in the huge aisles, as wide as the nave. The chancel was also rebuilt, but retaining its medieval roof. Until 1970, the church was hemmed in to the east, but the construction of Civic Drive opened up this view, which isn't a particularly good one, particularly from the north east. It comes as a surprise to find the west end on Portman Road quite so pastoral, but the hidden graveyard surrounding the tower is quite beautiful, and would once have been the familiar view. Ancestor hunters will be horrified to learn that the greater part of the graveyard was built over in the 1960s, with the construction of a church school to the south. All those graves are under the playground now. The part of the graveyard to the east fell foul of the road, and that immediately beyond the chancel was turned into a garden, now a haunt of homeless drinkers. A footpath runs along the north side, which will take you through to the main entrance, the west door, under the tower. 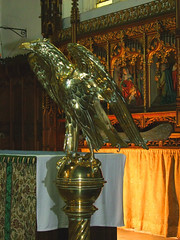 You step into a broadly Victorian interior, and find the font in the north aisle. 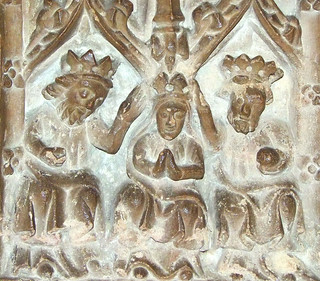 East Anglia is famous for its Seven Sacrament fonts, 13 of which are in Suffolk. These show the seven sacraments of the Catholic Church, and are rare survivals; so much Catholic iconography was destroyed by the Protestant reformers of the 16th century, and the Puritans of the 17th century. 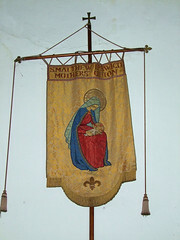 Here at St Matthew, we find an even rarer survival of England's Catholic past; a series of images of events associated with the Blessed Virgin Mary. Before describing it, I have to make the point that this really is one of the dozen most important and significant medieval art survivals in Suffolk, and one of the finest late medieval fonts in England. There is nothing as good as this in the Victorian and Albert Museum, or in the British Museum. 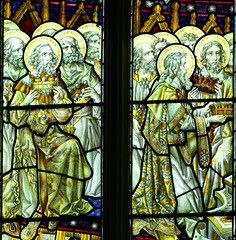 I make this point simply because on every occasion that I have visited, the person accompanying me (they don't let you vist the church on your own) did not seem to realise quite how important the font was, and gave the impression that the parish, though they care for it lovingly, also did not realise what a treasure, what a jewel, they had on the premises. "It's quite pretty," said the lady when I visited in September 2016. The leaflet in the church describes it as 14th Century, which the nice lady took as holy writ and didn't really believe me when I suggested that it wasn't. In fact, it was made during the first few decades of the 16th Century. 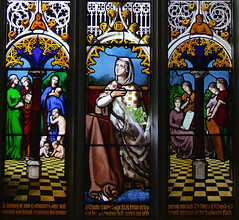 Of the eight panels, one has a Tudor rose and another a foliage pattern, but five of them depict events in the devotional story of Mary, mother of Jesus. These five reliefs, and a sixth of the Baptism of Christ, are amazing art objects. 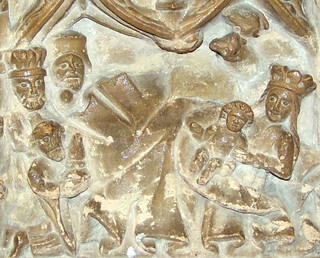 They show the Annunciation to the Blessed Virgin with Gabriel unfurling a banner from which a dove emerges to whisper in Mary's ear; The Adoration of the Magi, with the wise men pulling a blanket away from the Blessed Virgin and child as if to symbolise their revelation to the world; the Assumption of the Blessed Virgin, with Mary radiating glory in a mandala, which four angels use to convey her up to heaven in bodily form; the Coronation of the Queen of Heaven, the crowned figures of God the Father and God the Son placing a crown on the Blessed Virgin's head while the Dove of the Holy Spirit races down directly above her; and the Mother of God Enthroned, the crowned figure of the Blessed Virgin sitting on the left of and looking at (and thus paying homage to) her crowned son on the right, who is holding an orb. The late Dr John Blatchly thought that this last panel was a representation of Katherine of Aragon and her husband Henry VIII, which I think a little unlikely, although of course it could be both, one representing the other. 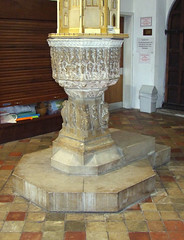 After extensive research, Blatchly showed convincingly that this font was paid for by the Rector John Bailey to celebrate the Miracle of the Maid of Ipswich, which occured in the parish in 1516 and was held in renown all over England in the few short years left before the Reformation intervened. 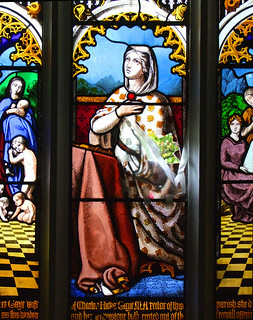 The popularity of the Miracle, in which Joan, a young Ipswich girl, has a near-death encounter and experiences visions of the Virgin Mary, was widely used by the Catholic Church as a buttress against the murmurings of reformers. 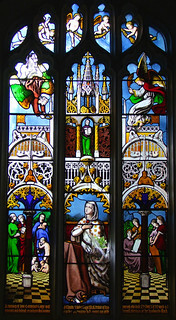 In The Miracles of Lady Lane by John Blatchly and Diarmaid MacCulloch, there is a fascinating if somewhat convoluted account of the battles between Bailey and Cardinal Wolsey, who was trying to consolidate his power in Ipswich by taking over the Shrine of Our Lady of Ipswich, which was in the parish of St Matthew. It is the kind of thing Trollope would have written about if he had been around in the 16th Century. Bailey's celebration of the Miracle was partly a way of competing with Wolsey for fame and influence, but Bailey's death in 1525 left the way open for the Cardinal, who in his turn would completely over-reach himself and fall in his own way. 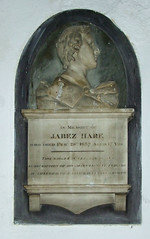 Remarkably, two of the four figures around the base are probably intended as Joan, the Maid of Ipswich, and John Bailey the Rector himself. The guide books describe these as the five Joyful Mysteries of the Rosary. In fact, this is technically not the case, although certainly the font was intended for use in rosary meditations. We know that the rosary was a hugely popular devotion in medieval England, and that a persons 'bedes' were their most valued possession. They played a major part in personal devotion, but were also important as a way of participating in the liturgy, and an expression of communal piety. Most pre-Reformation memorials show people holding their rosary beads. However, what we now think of as the Rosary sequence only dates from the 14th century or so, and was only one among many - the so-called Dominican Rosary, which is now the predominant meditation. The rosary was greatly popularised in England by St Thomas of Canterbury in the 12th century, who devised a series of seven joyful mysteries, including the Adoration of the Magi and the Assumption. Most sequences were of five meditations, and we must presume that this is what we find here. In time, the Joyful Mysteries would come to be Mary's earthly experiences, and the Glorious Mysteries her heavenly ones. Because personal devotion was considered a diversion from congregational worship, and Marian devotion was thought superstitious, the rosary was completely anathematised by the 16th century Protestant reformers, and attempts were made to write it out of history, by destroying images of it. Within forty years of this font being produced, possession of rosary beads was punishable by death in England. 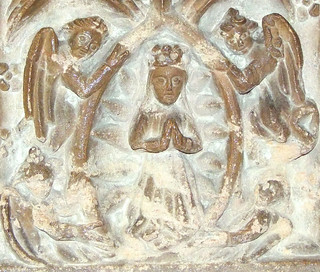 The survival of an image of the Assumption is particularly interesting. 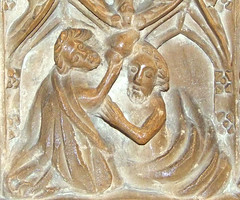 We still have much surviving evidence of religious life in England before the Church of England came along, but it does not really reveal to us the relative significance of different devotions, simply because some of the major cults and their images - St Thomas of Canterbury, for instance - were ruthlessly rooted out and destroyed. The Assumption is another case in point. 15th and early 16th century wills and bequests reveal a great devotion to the Blessed Virgin, particularly to the feast of the Assumption, which is celebrated on August 15th. This is at the height of the harvest, of course, and it is not difficult to see the connection between this feast and the culmination of the farming year, or the importance to farmworkers of a festival at this time. 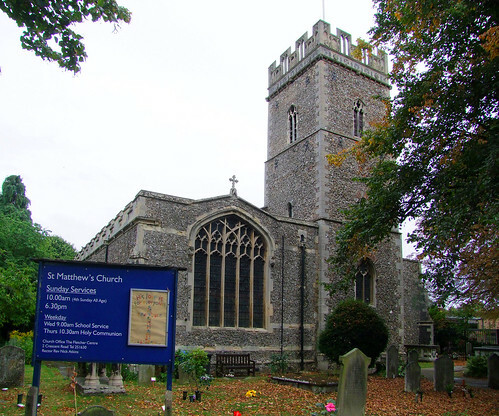 More than 200 Suffolk parish churches were dedicated to the Assumption. 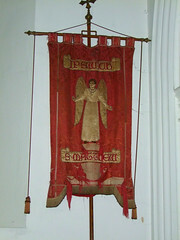 When the dedications of Anglican churches were restored in the 19th century, after several centuries of disuse, these generally became 'St Mary', although some have been restored correctly since, notably Ufford. The Church of England, of course, does not recognise the doctrine of the Assumption. Of equal significance are the other images, of course; extraordinary survivals. And why the Baptism of Christ? 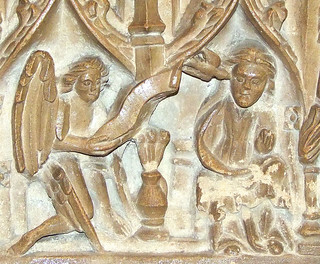 In fact, this is the most common 'odd panel out' on the Seven Sacrament fonts, and shows us the significance of 'anointing to serve' in the medieval church. The medieval church didn't see Baptism as a mere naming ceremony, or welcoming ceremony, as so many people seem to do today. It was the sacrament by which people received their commission as Christians. 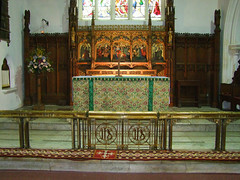 The north aisle also retains panels from the rood screen, built into a 19th century screen.You might miss these, because chairs are stacked against them. 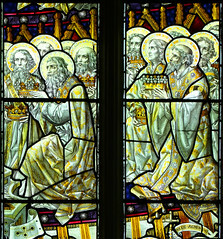 Three of the panels show bishops, and the other two show cheering crowds of seven and nine people respectively. I do not think that these can be in their original configuration. Roy Tricker thought that the crowds were portraits of parishioners, but I have seen elsewhere a suggestion that this may have been the screen to the chantry altar of the guild of Erasmus, which was established here. 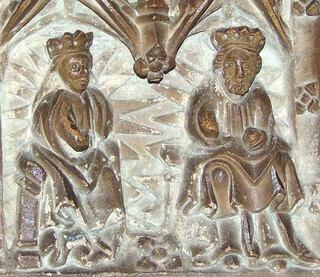 There is clear evidence of the location of at least one nave altar, since a squint kicks in from the north aisle. There are two good 17th century wall memorials in the chancel, the best being to Anthony Penning and his wife, depicting their children weeping, some holding skulls to show that they pre-deceased their parents. Much of the 19th century woodwork is from the workshops of two major 19th century Ipswich carpenters, Henry Ringham and John Corder. 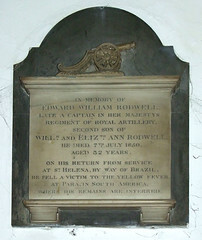 Ringham's work can be found in several Suffolk churches, most notably St Mary le Tower and Great Bealings, while Corder was an architect responsible for several restorations, including Swilland. Both have Ipswich roads named after them. 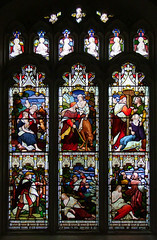 The church has an extensive collection of late 19th and early 20th Century glass, not all of it good, but happily by a wide variety of workshops. 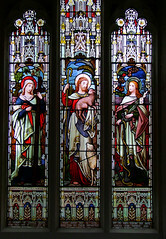 The great curiosity is the window in the east end of the south aisle, which depicts Jane Trimmer Gaye, wife of a 19th Century Rector, flanked by female members of her husband's flock with images of birth and death. 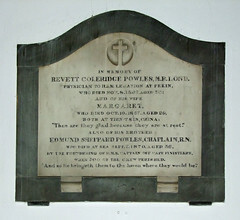 It was designed by her brother Frank Howard, and made by George Hedgeland. 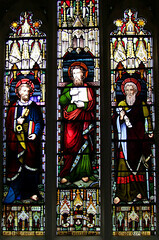 Another oddity is Percy Bacon's Christ flanked by St Edmund and St Felix - for the last hundred years the Saints have stood there with their names transposed. 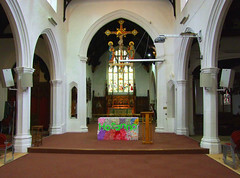 There is a frankly functional modern screen, with a curious Anglo-catholic style rood, which looks most out of place, for St Matthew today is very much in the evangelical tradition. But the lady who allowed me entry thought it 'nice', so I expect nobody minds.